Lost in the hullabaloo over an obscure Mexican holiday is that May 5 is also National Homebrew Day! Tyler Barber of Adventures in Homebrewing in Scio Township will be brewing, along with members of the Ann Arbor Brewers Guild. Hola, senors and senoritas! Shake off your siesta because there's a whole lot going on this Cinco de Mayo (aka National Homebrew Day), and you don't want to nap through any of it. Afterward, maybe, but not during. Forget the Most Interesting Dos Equis Guy and the Corona beach bums, we've got ourselves plenty of excellent beer to wash down all that Mexican-inspired grub right here in Washtenaw County, so without further ado, let's dive into it. Gringos welcome! » Witch’s Hat Brewing, 22235 Pontiac Trail, South Lyon, has been brewing up a storm ever since its opening late last year. Recently, they’ve installed larger tanks to add capacity just to keep up with the demand. And today is a good day to pay them a visit after work (they open at 5 p.m.), as back on tap are Scotch Ale and Holy Confusion, their popular barleywine style ale that packs a hop punch as well as an alcohol punch, at 10.2%. Careful with that pint, Eugene! » Arbor Brewing, 114 E. Washington, begins the Cinco de Mayo celebration a little early with “Drinko de Mayo” festivities. These include a special Mexican-inspired menu featuring Vegetarian Tortilla Soup, Chicken Chile Verde Soup, Shrimp Escabeche Salad, Fajitas Verdes, and Fajitas Carnes. And don’t miss mariachi singer Gustavo Dominguez performing in the Game Room during happy hour, 5 to 6:30 p.m.
» Over at Whole Foods Cranbrook, 990 W. Eisenhower, Founders is the featured brewery for Michigan beer tasting happy hour, 5-7 p.m. On tap will be Breakfast Stout, Double Trouble IPA, Old Curmudgeon Old Ale, Centennial IPA, and other great Founders beers TBD, all for the (nearly) unbeatable Whole Foods happy hour prices. Plus, they sell groceries and stuff, so there’s that, too. Today is the day Mexican homebrewers have been waiting for: It’s not only Cinco de Mayo, it’s National Homebrew Day! There’s lots of celebratory food, drink, and brewing activity today; below are some highlights. » Up and at ’em! The Sons of Liberty Homebrew Club based, obviously enough, at Liberty Street Brewing, 149 W. Liberty, Plymouth, are hosting a brewing demonstration on the brewery’s loading dock from 9 a.m. to 3 p.m. The demo includes both extract (aka “n00b”) and all-grain (aka “brewing ninja”) techniques, with members brewing at least 10 different batches, and questions about everything are encouraged! The brewery is providing hot dogs and chips, while the club plans on bringing some potluck dishes for supplemental nutrition. All are invited. » Over at Witch’s Hat, the fun begins at 10 a.m., when assistant brewer Aaron demonstrates an all-grain five gallon batch and answers questions while you, naturally, enjoy a fresh pint or two from the Witch’s Hat taps. » Also at 10 a.m., members of the Ann Arbor Brewers Guild are converging at Adventures in Homebrewing, 6071 Jackson Rd., Scio Township, for a regular brew-a-palooza. More than a dozen different homebrewing systems will be rocking, with the always friendly AABG folks ready to answer any and all questions about what they’re doing, not to mention the knowledgeable store staff (who are, in some cases, one and the same). Needless to say, there will also be Mexican food and plenty of camaraderie. » Arbor Brewing is pouring Casa Grande, a “Mexican style” Vienna lager that is 4.4% ABV and light and refreshing but adds notes of toffee and nut flavor. Musical performances and Mexican-inspired food and cocktail specials continue through Sunday. » Today is the last day to enter a beer in the Grizzly Peak Mug Club Brew-Off Homebrew Competition, which will be judged in the GP Den May 14. For details on how to enter, please see here. » From 5-8 p.m. Arbor Brewing is hosting the Ann Arbor Summer Festival Reveal Party, celebrating their partnership with the AASF and offering a pre-release taste of Festival Saison, a beer that will be available throughout the summer with a portion of sales going to support AASF. The recipe has been tweaked with peppercorn, so you’ll want to get some while you mingle with festival volunteers and supporters as well as fellow beer lovers. » Springtime means maibock, which for those keeping score is a traditional German style of beer that traditionally gets drunk by traditional people this time of year. “Bock” means “goat” in German, which, like, don’t ask. Anyway, enjoy two dozen different bocks, along with some Belgian Trappist ales thrown in for good measure, from 7-9 p.m. at Arbor Brewing’s monthly tasting. Tickets are $25 in advance and $30 on tasting day; call 734-213-1393 or stop by the pub to get yours. Congratulations also go to Arbor Brewing, whose Flanders Red took first in the WEB’s Sour Ale category and Bavarian Bliss took third in the Wheat/Rye Ale category. 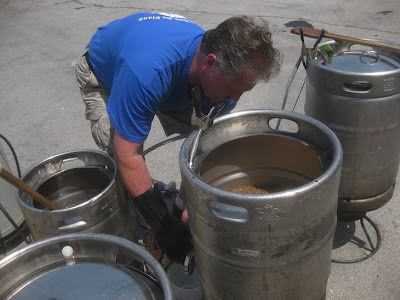 The Sixth Annual Brews Crews competition is coming up June 9 at the Corner Brewery, and the co-sponsoring Ann Arbor Brewers Guild are looking for help judging, beer stewarding, and/or otherwise making sure the event runs smoothly. Interested in helping out, or in entering your own beer into the competition? Visit brewscrews.aabg.org for more info.